Omni Cable 23/4P 23/4P Riser CMR Cat 6e data/voice cable features blue PVC jacket and high-density polyethylene insulation to provide resistance against moisture, heat and sunlight. This 0.236-Inch OD cable has UTP shielding to protect the signal from external interference. 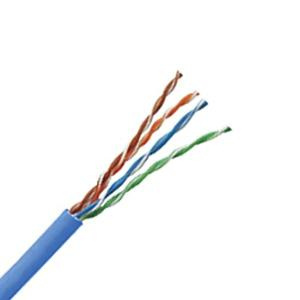 This bare copper cable is perfect for use in high-speed horizontal cabling, 100 Mbps TPDDI, 1000 Base-T Ethernet, 622 Mbps ATM and digital video applications. Cable has brown and white/brown stripe color-coded conductors for easy identification. Cat 6e data/voice cable meets EIA/TIA 568 and ISO/IEC 11801 standards.